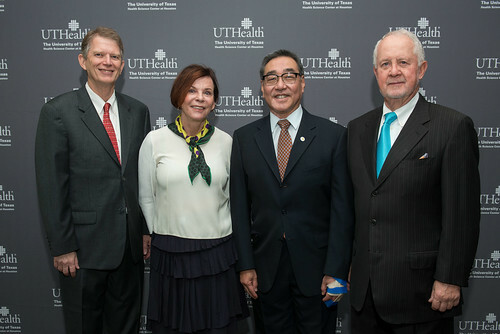 During a ceremony on Tuesday, Jan. 8, four distinguished scholars who have demonstrated longstanding excellence in the areas of teaching, research, and clinical care received the top honor awarded by The University of Texas Health Science Center at Houston (UTHealth) President Giuseppe N. Colasurdo, MD. Susan H. Landry, PhD; Leonard J. Cleary, PhD; and Mark E. Wong, DDS, FACD, FACS, were bestowed the 2018 President’s Scholar Awards. Richard J. Andrassy, MD, FACS, FAAP, FACN, FICS, received the President’s Recognition of Excellence Award. “It’s amazing how these four individuals have contributed to our university in their own ways,” Colasurdo said during a luncheon at the Cooley Center, where he recognized each awardee for their leadership. Kevin A. Morano, PhD, associate vice president for Faculty Affairs & Development, the Roger J. Bulger, MD Distinguished Professor and Distinguished Teaching Professor of The University of Texas System, introduced the 2018 recipients of the President’s Scholar Awards. “The selection criteria is rigorous, requiring evidence of innovation, recognition, exemplary service to faculty, students, and patients, and the elevation of the stature of UTHealth among our peers in Texas, the nation, and across the world,” Morano said. The awards acknowledge contributions of outstanding scholars and emphasize the fundamental importance of research, teaching, and clinical excellence to the mission of UTHealth. As her nominators state, Landry then took advantage of our life-changing breakthroughs in neuroscience diagnostics and treatment to establish three clinics to transform the lives of children and their families dealing with developmental and behavioral issues that span autism spectrum disorders, ADD/ADHD, and learning disabilities such as dyslexia. “I am truly honored to receive this award and consider it a tremendous recognition of the research I have done here at UTHealth,” Landry said. In accepting the award, Landry acknowledged the faculty and staff who share her passion for helping children develop to their full potential. As his nominators state, he made it a priority to adapt the curriculum based off student feedback, which illustrates his customary humility and desire to put the education of his students first. Cleary, who has served his entire academic career at McGovern Medical School, humbly accepted the award, acknowledging the team effort, and thanking faculty leaders who have championed his own career as well as the education of medical students. He also recognized his wife, Susan Andrew, MD, and their sons. “I am very grateful indeed for the opportunities and for the collaborations that have made it possible to take advantage of those opportunities,” Cleary said. As his nominators state, leveraging Harris Health relationships, Wong and others created and then increased staff for a dedicated oral surgery outpatient clinic on Monroe Street, and its success is such that a waiting list of 1,700 outpatient visits is now down to negligible numbers. Wong acknowledged the impact the other three awardees have made on his personal and professional life. He also thanked faculty, staff, and his family for their infinite support. This special award was created by Colasurdo to recognize overall exemplary dedication and service to the institution, while demonstrating longstanding excellence in his or her chosen field. This year, Andrassy became only the second scholar at UTHealth to receive the President’s Recognition of Excellence Award. Kevin P. Lally, MD, MS, FACS, professor and chair of the Department of Pediatric Surgery at McGovern Medical School, the A.G. McNeese Chair in Pediatric Surgery, and the Richard J. Andrassy, MD Distinguished Chair in Pediatric Surgery, introduced his longtime friend and colleague. Lally noted that Andrassy is the longest serving chair of a surgery department in the country, is quick to step into leadership roles when needed, and also made significant contributions to the formation of UT Physicians. “He is a rare combination of a highly effective leader and a truly nice guy,” Lally said. “It has been a privilege to be here all these years,” Andrassy said. He thanked Colasurdo, McGovern Medical School Dean Barbara Stoll, MD, faculty, staff, and also his family for their support. He also acknowledged Elizabeth “Mickey” Clouser, longtime executive services administrator in the Department of Surgery. Michael Blackburn, PhD, executive vice president and chief academic officer, gave closing remarks, congratulating the awardees, thanking each of their families, and recognizing previous winners of the President’s Scholar Awards. “I am proud to be your colleague and we thank you for your service to the university,” Blackburn said.